The Book of Enoch: Fraud, Lost Scripture, or Something In Between? A lot of what we will be talking about in the weeks to come will seem very foreign and may raise some skepticism; but, it is is a very real and present danger. It ties somewhat to the mindset during the days of Noah and will likely factor greatly into the End Times scenario, so it’s a topic that we’ll be pursuing for a while; but first, I feel it is necessary to get a good feel for what those days were like which will require delving into the historical sources; both biblical and extra-biblical. As a presuppositionalist Christian; the ruling assumption of my life is that Scripture is accurate and perfect in any matter it deals with. My understanding may not be perfect at all times; but, God has a way of correcting our mistaken beliefs as He fashions us into the image and likeness of Christ. Bottom line, I care to be biblically correct even if it means not being politically or socially correct. Where other texts go, I take them for what they are and if they contradict Scripture, it is the work that is wrong, not Scripture. In terms of the fallen angels who sinned, I have always believed that they were just that. It’s just what the surface of the text says and when the Bible makes common sense seek no other sense. Some have latched onto the beliefs espoused by Nicene & Post-Nicene fathers such as Augustine who explained the happenings in Genesis 6 as being the righteous sons of Seth mating with the evil daughters of Cain. I never believed that theory and do not believe it is scripturally sustainable. Still, the fallen angels theory isn’t without some tension. For instance, these angel-human hybrids…did they have souls? Were they saveable? How can ‘kinds’ mix? These are questions we shall revisit later when we discuss what’s going on today in the world of science. Another question that troubles many is the role of the book of Enoch in telling the story. Let me state first, I have not read, nor do I have interest in reading, the entirety of the book of Enoch. I know that it was rejected by Jewish and Christian authorities for inclusion in the canon of Scripture and much of the later portions of the book may even be heretical (though I think some of the objections found at other sites are overreaching in labeling certain areas heresy). Since the book is assumed to be several works combined as “the Book of Enoch” it may be the more heretical portions polluted what was once a good book seeking to teach something that is theologically true. Who’s to say. It is argued, however, that the early church fathers such as Clement of Alexandria, Irenaeus, and Origen believed it to be as authoritative as any book of Scripture and Tertullian noted: “But as Enoch has spoken in the same scripture of the Lord, and ‘every scripture suitable for edification is divinely inspired,’ let us reject nothing which belongs to us. 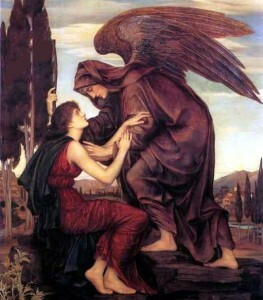 It may now seem to have been disavowed by the Jews like all other scripture which speaks of Christ—a fact which should cause us no surprise, as they were not to receive him, even when personally addressed by himself.” So, at least portions of Enoch were highly regarded by the earliest church and as such should at least be considered (in a proper setting an context) worthy of our exploration. Others are obviously not true and should be rejected. In either case, it should not be elevated to the level of Scripture nor should Jude’s quoting from it be considered an all-encompassing endorsement. Rather, I hold Enoch as an interesting read that probably has some elements within it that were passed down as tradition from the time of Noah and others that were creations of the authors at later times. Like any apocryphal book, it may have parts that are historically true, but it isn’t Scripture nor should it be. This doesn’t mean that it isn’t worth our time to study it, however. For the purposes of this blog, we will just look at 1 Enoch, for it relates most closely to the topic of hand. In our last post, we went over the portion of Enoch which Jude quoted from, which is highly eschatological in nature and will be a topic of a future post. For now, let’s skip to the portion which relates most closely to Genesis 6 – that is, 1 Enoch 6. And it came to pass, when men began to multiply on the face of the earth, and daughters were born unto them,That the sons of God saw the daughters of men that they were fair; and they took them wives of all which they chose. And Semjaza, who was their leader, said unto them: ‘I fear ye will not 4 indeed agree to do this deed, and I alone shall have to pay the penalty of a great sin.’ And they all answered him and said: ‘Let us all swear an oath, and all bind ourselves by mutual imprecations 5 not to abandon this plan but to do this thing.’ Then sware they all together and bound themselves 6 by mutual imprecations upon it. And they were in all two hundred; who descended in the days of Jared on the summit of Mount Hermon, and they called it Mount Hermon, because they had sworn 7 and bound themselves by mutual imprecations upon it. And these are the names of their leaders: Samlazaz, their leader, Araklba, Rameel, Kokablel, Tamlel, Ramlel, Danel, Ezeqeel, Baraqijal, 8 Asael, Armaros, Batarel, Ananel, Zaqiel, Samsapeel, Satarel, Turel, Jomjael, Sariel. These are their chiefs of tens. So, we see here where the book of Enoch portrays the sin of Genesis 6 as a mutiny of the angels against God’s created order which devolved into all sorts of debauchery and produced the giants who were the most evil of all beings who were into all sorts of sexual perversion and even cannibalism and vampirism. Yuck! The book goes on with other things the angels taught humanity, corrupting it to the point that the good Angels such as Michael raise a protest to God who then pronounces judgment and sets the stage for the flood: And so, God condemns these mutinous angels and binds them for 70 generations (interestingly, if Ussher’s chronology is correct, that puts their judgment some place within the next 100 years). In chapter 15, He also speaks of their progeny as having evil spirits coming out from them which will roam the earth and oppress men and women from whom they came. Interesting reading for sure, but now lets bounce it against Scripture to see what we know. These two verses square with Enoch in that the angels left their position, gave themselves over to fornication, went after strange flesh, are in chains until judgement and will suffer vengeance of eternal fire. So far, so good. So, it is probable that this was a book that was circulating at the time and that the early church and disciples found at least some of it somewhat authentic. It appears there may have been some later additions to it which weren’t of the same character; but, all of it or most of it had been written by about 100BC (much around 300 BC during the diaspora).